Your letter of the 29th. just received. The contents of your letter was fully noted and will be satisfactory. 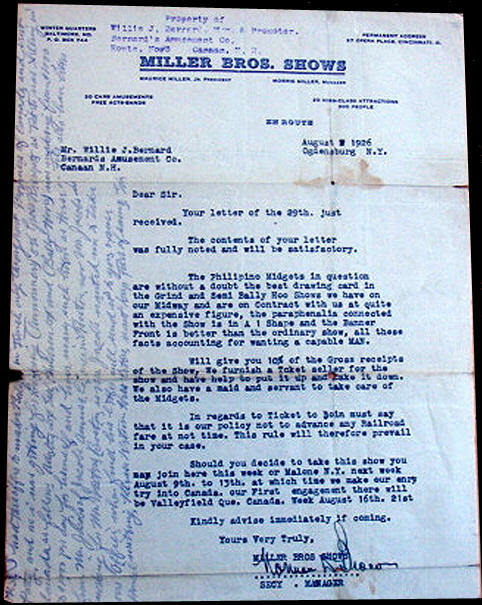 The Phillipino Midgets in question are without a doubt the best drawing card in the Grind and Semi Bally Hoo Shows we have on our Midway and are on Contract with us at quite an expensive figure, the paraphenalia connected with the Show is in A1 Shape and the Banner Front is better than the ordinary show, all these facts accounting for wanting a capable MAN. Will give you 10% of the Gross receipts of the Show. We furnish a Tcket seller for the show and have help to put it up and take it down. We also have a maid and servant to take care of the Midgets. In regard to Ticket to join must say that it is our policy not to advance any Railroad fare at not time. This rule will therefore prevail in your case. Should you decide to take this show you may join here this week or Malone N.Y. next week August 9th to 13th, at which time we make our entry into Canada. our First engagement there will be Valleyfield Que. Canada. Week August 16th, 21st. Kindly advise immediately if coming.